The number of Americans filing for their first week of unemployment benefits fell last week to the lowest level in nearly six months, possibly signaling slight improvement in the job market. There were 391,000 initial unemployment claims filed in the week ended Sept. 24, the Labor Department said Thursday, down 37,000 from the prior week's revised 428,000. The drop was much better than expected, as economists forecast initial claims to fall to 419,000, according to Briefing.com. New claims for unemployment benefits have stuck around or above 400,000 since early April, a level economists often say is too high to signal the unemployment rate will come down anytime soon. The recent drop to 391,000 maked the lowest level since the week of April 2, when 385,000 new claims came in. Still, economists cautioned against getting too excited about the better number. It's just one week of data, and according to a government spokesman, seasonal adjustments could have impacted the calculation. Click here for the CNN story. Click here for the release from the U.S. Dept. of Labor. New home sales and prices continue to fall, but inventory totals just 6.6 months. Data through July 2011, released by S&P Indices for its S&P/Case-Shiller Home Price Indices, the leading measure of U.S. home prices, showed a fourth consecutive month of increases for the 10- and 20-City Composites, with both up 0.9% in July over June. Seventeen of the 20 MSAs and both Composites posted positive monthly increases. The month-over-month bump is most likely due to the seasonal boost the housing market gets over the summer and will most likely do little to cheer economists about the housing market's future. "While we have now seen four consecutive months of generally increasing prices, we do know that we are still far from a sustained recovery," David Blitzer, chairman of the S&P index committee, said in a release announcing the new data Tuesday. The rise in prices made for the fourth consecutive month of gains. Earlier this year the index pushed below its previous bottom hit in April 2009, confirming a much-feared double-dip, but has come back above that level since. estimates released jointly today by the U.S. Census Bureau and the Deparhttp://www.blogger.com/img/blank.giftment of Housing and Urban Development. This is 2.3 percent below the revised July rate of 302,000, but is 6.1 percent above the August 2010 estimate of 278,000. The median sales price of new houses sold in August 2011 was $209,100, down by more than 9% from the previous month as builders slash prices to compete with discounted foreclosures; the average sales price was $246,000. The seasonally adjusted estimate of new houses for sale at the end of August was 162,000. This represents a supply of 6.6 months at the current sales rate. Should sales pick up, this inventory could be quickly reduced, thereby creating more demand for new product. I finally got a chance to watch Nova's special on the rebuilding of Ground Zero in New York City on PBS. 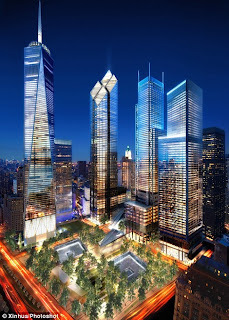 It's a fascinating program from both the perspective as a building industry professional and an ordinary citizen of the U.S. For me, it also helps to bookend my visit to Ground Zero 10 years ago, which I wrote about in a previous blog post on 9/11/11. 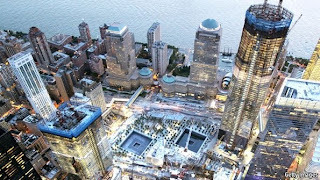 Besides the innovative architecture and construction techniques used to build the $3 billion, 105-story One World Trade Center (formerly known as the Freedom Tower), the program also covers the 9/11 Memorial, entitled "Reflecting Absence" and one of 5,000 entries chosen as the winning design (and I think a beautiful work of art). Please click here to see the edition of BuilderBytes for 9/22/2011 on the Web. In this issue of the MetroIntelligence Economic Update, I covered the Federal Reserve's latest efforts to boost the economy and lower long-term rates (including mortgages), sales of existing homes, builder confidence levels, building permits and mortgage applications. As part of its ongoing association with Beacon Economics, MetroIntelligence authored the residential real estate section for the recent San Diego Economic Forecast Conference, which took place on September 20th at the Hilton San Diego Bayfront Hotel. If you'd like to read the section in its entirety, as a service to current and potential clients, we've made it available for free on our Web site (a $175 value). So next time you have consulting needs, please be sure to contact us to discuss how we can help. Don't be shy! Falling home prices in San Diego County have made them much more affordable, with 52% of households able to buy the median-priced home at current interest rates, up exponentially from the mid-single digits noted from the last half of 2004 through the end of 2006. While tax credit programs did help the S&P/Case-Shiller Index to recover some of the losses in home prices noted between 2006 and 2009, since their expiration the index has been slowly declining, hovering close to levels last noted in the last quarter of 2009. 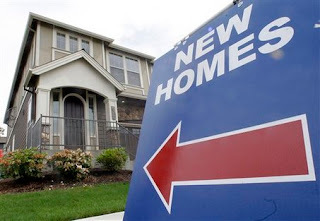 Although slowly recovering, new home sales remain quite depressed as they continue to compete with discounted foreclosures and short sales, with prices softening to $447,166 following the expiration of the tax credit programs of 2009 and 2010. While sales of existing homes are still down by 45% from their 2003 peak, over the last 18 months they’ve continued to range from 5,500 to 5,900 homes per quarter; prices are up by about 11% from the lows of early 2009 but have softened in recent months to about $360,000. After staging a minor rebound in early 2008, sales of condominiums have again softened to about 2,600 sales per quarter as first-time buyers look instead for single-family bargains; after falling by nearly 50% since the 2006 peak, prices have rebounded moderately but continue to range from $210,000 to $225,000. After several years of struggle, the local apartment market is definitely on the mend, with vacancy rates slowly trending down towards 5.0% as quarterly rent hikes have bounced back into positive territory and are projected to continue rising by 0.7% to 1.0% per quarter. Both default and foreclosure activity is trending downwards, with defaults – often the precursor to a foreclosure – at the lowest levels seen since early 2007. After experiencing considerable declines, building permits are slowly rebounding. Most of the single-family activity is taking place in the outlying areas of South Bay and North County, whereas most of the multi-family activity has been noted in the City of San Diego, Escondido and Chula Vista. As part of its ongoing association with Beacon Economics, MetroIntelligence authored the commercial real estate section for the recent San Diego Economic Forecast Conference, which took place on September 20th at the Hilton San Diego Bayfront Hotel. Having reached a cyclical trough in the second quarter of 2011, the San Diego office market should slowly begin to improve, with vacancies falling below 17% and rent growth squeaking out a small gain of nearly 1% by the end of the year. With the county’s retail market finally on the rebound by the second quarter of 2011, look for economic vacancies to fall by 80 basis points to 8.4% by the end of 2011 as rent growth rises by just over 1.5%. Because San Diego’s industrial/warehouse market is so closely intertwined to the local economy, its rebound will likely trail those of the office and retail sectors, with vacancies not falling below 12% until the third quarter of 2011 and rent growth remaining under 5% per quarter until the end of 2012. Based on commercial building permit values, many building owners are investing in additions or alterations to existing properties; for new development, the strongest rebound in the second quarter of 2011 was for future office properties, followed by sporadic growth in the retail sector and declines for new industrial properties. With interest rates for 10-year U.S. Treasury bonds recently trending down towards 2%, cap rates during the second quarter of 2011 for all commercial property sectors look quite competitive by comparison, ranging from 6.4% for industrial/warehouse properties to about 7.8% for the office and retail sectors. Even if you missed the San Diego Economic Forecast Conference on Sept. 20th at the Hilton San Diego Bayfront Hotel, you can still get conference materials! Beacon Economics regularly provides these materials free of charge on their Web site after the conference, so if you have consulting needs, please be sure to contact them. Don't be shy! Click here to download Christopher Thornberg's presentation on the California & U.S. economy. Click here to download Brad Kemp's presentation on the San Diego region. And finally, click here to download the conference book in its entirety (includes both the commercial and residential real estate sections authored by MetroIntelligence). Like many others of my generation, I grew up with Apple products from the Macintosh to the iPad. When I bought my last car, I made sure it offered a direct connection from an iPhone or iPod to the stereo system, and I regularly give iTunes gift cards to family members under 25. When my parents got sick of the constant viruses and software updates to run their standard-issue PC, even when approaching age 70 they decided on an all-Apple format for their home office. In other words, this is a company which has become so pervasive that it’s cut across almost all the lines which often separate consumers – gender, age, ethnicity, religion, language and, to an extent, income – while in the process managing to shake up several legacy industries and creating one of the world’s most valuable companies. Now that Apple CEO Steve Jobs is shifting gears to become the company’s non-executive chairman, I started thinking about rare it is to have a business visionary like Jobs and what the building industry might learn from his success. 1. Jobs is a perfectionist, once reportedly forcing his team to pull an all-nighter to replace headphone jacks on the first iPod because they didn’t “click” enough to confirm a connection. I remember being in a meeting several years ago with a sales duo from a previous employer, and when questioned about some bad data in a database, instead of acknowledging the issue, one of them said, “Well, when you build the perfect house, we’ll provide the perfect database.” Can you imagine Jobs answering that way? 2. 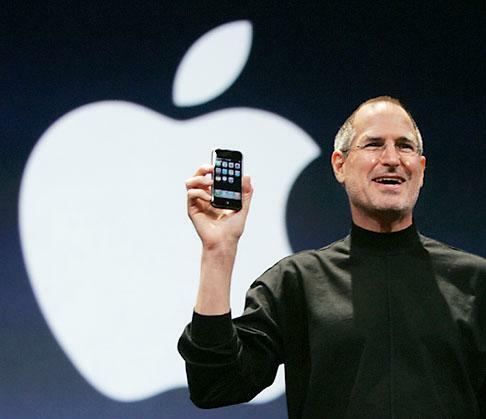 Jobs was ruthless with his own products, killing off promising technologies (such as a Palm Pilot clone) when there were better designs down the road (such as the iPhone). So, although there are certainly economies of scale when building the same floor plans and elevations in different markets, the downside of that myopia may mean tired, boring designs at a time when the foreclosure pipeline is full of them at a significantly cheaper price. 4. Jobs never stopped studying, whether it was admiring the bodywork of European cars when designing a computer case or obsessing over the collateral used by Sony to decide on the right fonts, design and paper weight for his own brochures. Although the building industry is somewhat unique in that you can actively walk through your competitor’s products, there are also lessons to be learned from the fields of retail, fashion and entertainment. 5. Less really is more. The iPod wasn’t the first music player on the market, but it was clearly the simplest, relying on a single scroll wheel instead of a hodgepodge of confusing buttons. Today’s well-designed home doesn’t need to be huge or busy or grand. It just needs to prove that it can meet the needs of a busy resident with thoughtful touches. While some may disagree with his methods, it’s almost impossible to argue with the results. Please click here to see the edition of BuilderBytes for 9/19/2011 on the Web. In this issue of the MetroIntelligence Economic Update, I covered how action by the world's central banks lifted investor sentiment (at least temporarily), the unemployment rate for August, consumer prices, industrial & manufacturing figures, consumer sentiment and the latest comments from the Philadelphia Federal Reserve Business Outlook Survey. My column for the September 2011 issue of Builder & Developer magazine is now posted online. For this issue, entitled "Is Your PR Strategy Up to Date?," I wanted to review how rapid changes in social media continue to impact today's PR strategies. Although many builders and associates are far beyond the curve on this issue, they can quickly catch up! To read the entire September 2011 issue in digital format, click here. Please click here to see the edition of BuilderBytes for 9/15/2011 on the Web. In this issue of the MetroIntelligence Economic Update, I cover why California Economist Christopher Thornberg doesn't see a double-dip recession, the rise of mortgage applications, prices for U.S. imports and exports, the producer price index, retail sales and business sales & inventory levels. 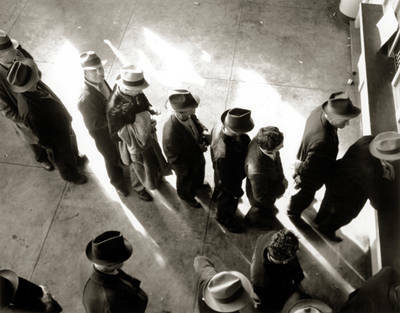 Is a 'double-dip' recession on the way in 2011 or 2012? What's around the corner for consumer spending, home prices, and employment? How will the slow down in the national economy affect San Diego's recovery? Battles over the regulation of Wall Street are heightening in Washington. What sort of regulations are being proposed? How will they affect the banking and financial industry? Can proposed regulations really prevent a repeat of the abuses that occurred prior to the 2008/09 recession? Or do they miss the mark completely? Will regulation help or hurt businesses ability to acquire new capital? Are there dangerous unintended consequences? Special discount available through MetroIntelligence, which produced the sections for the conference book on commercial and residential real estate: Use discount code metrosd to save $30 on registration. In a new feature for BuilderBytes, the twice-weekly newsletter emailed to over 100,000 subscribers from Peninsula Publishing, I am now going to be covering recent economic statistics released through various sources since the last edition. This latest feature is an extension of my current relationship as a regular columnist for the publisher's flagship title, Builder & Developer magazine. I had been wanting to create a regular newsletter that was different from the others which currently fill your inbox(es) for some time, and since BuilderBytes was in the middle of being re-designed, this was the perfect opportunity to begin my new contribution. Entitled the "MetroIntelligence Economic Update," the purpose of the new section is to provide one-stop shopping for updates on the U.S. economy in terms of unemployment, housing, auto sales, consumer confidence, mortgage applications, etc. so you can react in real time for your own businesses. Each issue will include brief summaries of the update along with a link to the original source. Please click here to see the edition for 9/12/2011 on the Web. In this issue, I cover economist Mark Zandi's review of the Obama jobs plan, unemployment claims, the U.S. trade deficit, consumer credit and wholesale inventories. It's very easy for me to remember 9/11 for two reasons: besides the attacks in New York and at The Pentagon in 2001, it's always my younger brother's birthday. So for him, I'm sure, it's a bittersweet day -- one in which he celebrates his own birth today outside of Philadelphia, yet also can't forget the deaths of those in New York and Virginia as well as just 220 miles to the west, where United Airlines Flight 93 crashed to the ground near Stonycreek Township instead of into its intended target, the White House. Two short months after 9/11/2001, I went to visit my older brother for Thanksgiving, who was living in mid-town Manhattan. While he personally didn't know anyone killed at the World Trade Center, he had in fact previously worked in the same section of The Pentagon that had been hit by the third plane. I had been to NYC a few times before, but this time felt different -- quieter and more reflective. One afternoon, I felt compelled to take the subway down to visit Ground Zero, but neither my brother nor his fiance wanted to accompany me, so I went alone. Since the World Trade Center station was obviously closed, I deliberately chose a couple of stations earlier on the assumption that I'd have some time to get re-acquainted with Lower Manhattan at ground level before moving towards the site. I was wrong. As I walked up from the subway steps to street level, I was greeted with the still-smoldering ruins of the collapsed buildings. But what I remember most is what I can only describe as the most depressing scent I've ever experienced before -- a combination of chemicals, smoke and death. It's something I hope to never smell again. To shield the continuing recovery and salvage operation from public view, the city had installed solid plywood fencing around the entire site. For tourists hoping to grab a few shapshots of the carnage, on the fence the NYPD had stenciled "No Photos By Order of the NYPD" every few feet. I took no photos. As I walked around the perimeter of the site, I noticed the damage to nearby buildings from falling debris -- a hole punched through the glass ceiling of a multi-story atrium here, a huge chunk of another building sliced off there. Throughout the area, family members and friends had posted hundreds of flyers with photos of potential victims and asking "Have You Seen Me?" on almost every available pole and bulletin board. Like the scent which hit me upon walking up from the subway station, this was a sight I would never forget. Finally, near a wooden flatform area that had been quickly constructed as a sort of gathering place, there were multiple memorials to loved ones. It was at this point that I decided I had seen enough: I wasn't a local, and I had nothing to offer but my curiosity, so I returned to the subway station to return back to mid-town. During the trip back, lost in my own thoughts, I had no doubt that the city would rebuild and the country would do whatever necessary to protect itself. Ten years later, although the physical and psychological wounds are taking time to heal, they are healing. Some 14m s quare feet (1.3m square metres) of office space was damaged or destroyed and 65,000 jobs were lost or relocated. Hundreds of businesses closed, some permanently. Yet ten years on, the area is doing well. According to the Downtown Alliance, its vacancy rate is one of the lowest in the country. The volume of apartment sales has increased by 151% since 2003. The resident population has more than doubled, to 56,000, since 2001. Six new schools have opened there since 2009. Last year almost 10m tourists visited. Many stay at one of the 18 hotels in Lower Manhattan, three times the number in 2001. Though many companies fled in the first two years after the attacks, today there are more downtown than there were in 2001. You can read the the entire article by clicking here.